Four Points by Sheraton Bangkok @Thailand - Always Travelicious ! Chic and artsy, Four Points by Sheraton Bangkok at Sukhumvit 15 is easily accessible with the closest BTS Asok Station at a mere 5 minutes walk away. Shopping, eateries are plenty with the popular Cabbages and Condoms Restaurant just 10 minutes walk away. The hotel’s lobby area is full of energetic vibe. The business center is just next to it should you need to use a computer quickly. The chic and artsy motif continues in our room with neutral colors, accentuated by floral patterns on the wall and a dash of red on the cushion. A sleek working table which is most likely not going to be used because why? You are in Bangkok to have some fun! The partition between the room and the bathroom is adjustable, so you can close it for privacy, or open it up to extend the space, or if you want to watch TV from the bathtub ! The bathroom’s mirror has a piece of white post-it stuck on it, which is a discount voucher to get 15% off at The Eatery at the hotel. That’s a nice way to catch someone’s attention ! Who would resist the temptation and not tear off to see what’s written on that post it? 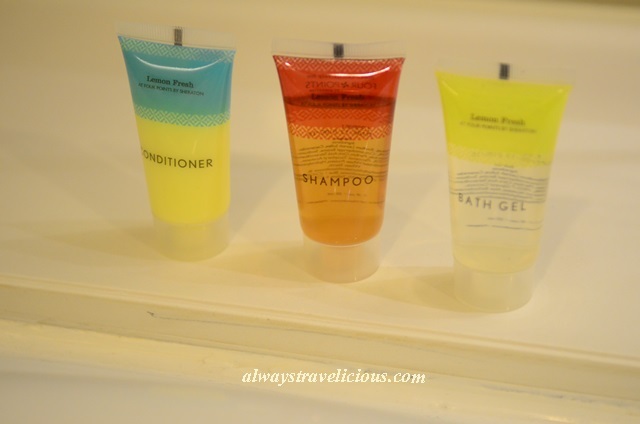 The bathroom accessories are vibrantly colored – somehow reminds me of Malibu, both the alcohol and the beach. The coffee facility and junk food is at your disposal. And this is The Eatery we would have eaten if we had a little more time in Bangkok. Pingback: Bangkok Itinerary - Best of Bangkok - Always Travelicious !